Man Bites Murdoch is a must read for anyone interested in behind the scenes stories and inner workings of print media in any so-called Western democracy. While the names and places focus on Australia and mainly Melbourne one suspects you could transplant the story to any major Western Capital. What stands out is the pressure on newspaper Editors to resists – or indeed succumb to – Big Business interests and political interference. The book reveals Rupert Murdoch to be a man who demanded and inspired sycophantic followers among his executives and a man who disdained any kind of serious intellectualism in both the running and in the content of his media empires. Of course this will come as no surprise to many. It is however revealing in light of more recent events. Namely the closure of News of The World amid the stench of institutionalised corruption so foul that Murdoch was forced to appear before a select committee and humble himself in front of the cameras and therefore the world. See video mashup below. 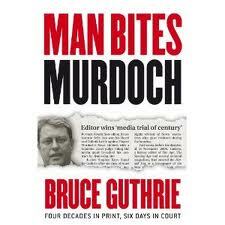 One of the defining moments of Man Bites Murdoch is Bruce Guthrie’s account of a now infamous gathering of the Murdoch executive at Aspen Colorado in 1988. A presentation to the assembled coterie by Tom Petrie Editor of The Sun in London revealed stories of chequebook journalism, general skulduggery and ultimately heavy lifting of rival paper’s stories . . .For anyone who took journalism seriously it was appalling. When Murdoch asked for questions Bruce Guthrie courageously enquired Do you have any ethical framework at all at the London Sun? As Guthrie reports it this produced shouts of derision, raucous laughter and general hysteria. Murdoch himself intervened at the time saying I would have thought it’s news if the captain of the English cricket team is taking barmaids up to his room the night before a test match. Murdoch later remarked to Guthrie’s Australian boss Ken Cowley I see we have aFairfax wanker in our midst. An excellent synopsis of an oligarch.